Russia may sign a new agreement with the U.S. for cooperation in the disposal of obsolete weapons and in the non-proliferation of weapons of mass destruction, to replace the Nunn-Lugar program. By strengthening cooperation in the spheres where their interests coincide, Russia and the U.S. might heal some of the recent cracks in their relations. 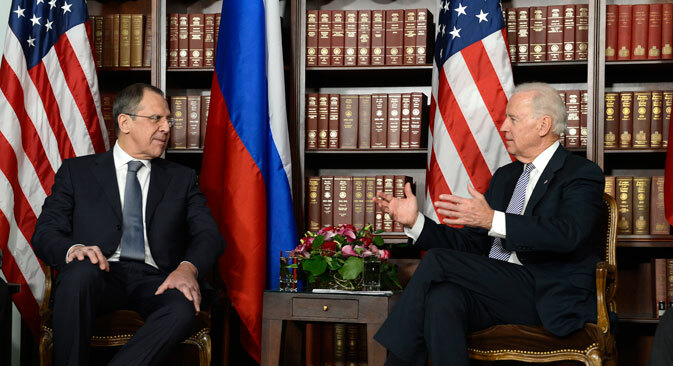 The United States wants to bring its relations with Russia back on track, U.S. Vice President Joe Biden told Russian Foreign Minister Sergey Lavrov. Washington proposes starting the normalization of relations with practical cooperation in spheres that do not give rise to controversy. One such sphere is the non-proliferation of weapons of mass destruction. In his speech this time around, Biden said that the reset had not been in vain, recalling the signing of the START treaty, the peaceful nuclear energy agreement, Russia’s accession to the WTO, the creation of a bilateral presidential commission, cooperation on Afghanistan, as well as cooperation on the Iran and North Korean nuclear problems. At the same time, Biden said that the U.S. would “never recognize” the sovereignty of Abkhazia and South Ossetia and would not agree to individual countries having special spheres of influence. He listed other topics on which the U.S. and Russia differ, including Syria, ABMs, NATO expansion, democracy and human rights. It would seem that, after this exchange of mutual accusations, there would have been a lot of plain talking during the Biden-Lavrov meeting. All the more surprising, therefore, was the Russian minister’s controlled statement after the meeting. A source in the Russian delegation explained Lavrov’s optimism: Biden told the foreign minister that the U.S. would like to put its relations with Russia “back on track” and was thinking about how to do it. Lavrov was obviously in the mood for compromise after his meeting with Biden. “Both sides understand that, alongside the differences, we have many interests in common,” said Lavrov. One such interest is in the non-proliferation of weapons of mass destruction (WMD). The Russian authorities decided not to extend the Nunn-Lugar program, which expires in June 2013. Under the program, excessive Russian nuclear warheads and obsolete strategic missiles have been disposed of since the early 1990s, with the U.S. paying the cost. Moscow says it no longer requires these subsidies. The source said an example could be the 2002 agreement on plutonium disposal, which was updated in 2010 and whereby both sides share the cost and responsibility fairly. Under the Nunn-Lugar program, the American contractors hired to work in Russia bear no responsibility for any accidents or emergencies they might cause. When signing the new agreement, Moscow would like to limit U.S. access to some facilities. The new agreement might envisage use of joint expertise in the disposal of WMD from third-party countries. That, however, could entail some problems. Speaking in Munich, former congresswoman Jane Harman named Syria (with its chemical arsenal) and Pakistan (with its nuclear arsenal) as potential places for such cooperation, while Sam Nunn, co-author of the Nunn-Lugar program, mentioned North Korea and Iran. Still, none of these countries has yet asked for help in disposing of WMD.